Just to provide some quick context, this is the same team of researchers who published a study claiming premature birthrates were higher in counties closest to shale wells, even though they were right in line with the national premature birth rate. One of the researchers that stands out is Brian Schwartz, a fellow at the Post Carbon Institute which has called fracking a “virus.” Considering that background, it’s not surprising that, despite the fact that study after study, including data from the Environmental Protection Agency, has shown that fracking does not harm air quality, the researchers apparently started the study with the following preconceived (and debunked) assumption. By comparing the electronic health records of 35,508 asthma patients “with and without exacerbations” treated at Geisinger Clinic between 2005 and 2012, the authors claim to have identified 20,749 mild asthma exacerbation instances (new oral corticosteroid medication order), 1,870 moderate (emergency department visit) and 4,782 severe (hospitalization) asthma exacerbations that they claim show an “association” to residential proximity to natural gas development. One would think that if you were going to study whether fracking contributed to asthma exacerbations you could want to compare patients with exacerbations in counties with shale development to patients with exacerbations in counties without shale development. But the researchers didn’t do that. Instead, they only looked at whether patients with exacerbations lived near a shale well. The above graphic shows that most of the counties with significant numbers of asthma patients have little to no shale gas production. Curiously, the county with the most shale gas wells in the state, Washington County, wasn’t even included in the study. A vast majority of Geisinger’s patients reside in the counties highlighted in dark blue, each of which have little to no natural gas development. So based on the graphic above, it is clear that a vast majority of the 35,000-plus asthma patients included in the evaluation live in areas with little-to-no development. Which begs the question: How relevant could the relatively small number of patients included in the study who reside close to natural gas wells be considering a vast majority of Pennsylvania residents who live in areas with shale development were not included in the study? All of this brings us back to the question of why the researchers didn’t compare data county-by-county. 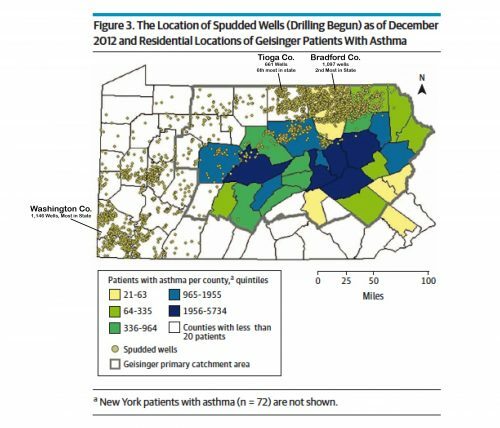 For instance, although between just 21 and 63 Geisinger asthma patients live in Bradford County — which has the second-most shale wells as any county in the state — data comparing Bradford County asthma exacerbation rates with counties with no shale development might have given a better picture of whether there was an association. But maybe the data didn’t support the researchers’ narrative, and therefore wasn’t included in the study? What’s more, not only were a vast majority of Pennsylvanians who actually live close to natural gas wells not included in the study, the researchers included 72 patients who reside in New York state, which has, of course, banned fracking. The researchers also concede that one of the study’s limitations is that it doesn’t consider what the patients’ occupations are, which could be major contributors to exacerbating their asthma. Fact #4: Multiple Pennsylvania studies have shown the oil and gas industry is not impacting air quality in areas of development. Not only does the Johns Hopkins asthma study dismiss the aforementioned Marcellus studies that have shown low emissions at well sites, it also ignores the fact that fracking is the No. 1 reason that three pollutants linked to asthma — nitrogen oxide (NOx), sulfur dioxide (SO2) and fine particulate matter (PM 2.5) are all in rapid decline. A recent study of the U.S.’s top 100 biggest power plants, which account for 85 percent of the country’s electricity, found that SO2 emissions are down 80 percent, while NOx emissions are down 75 percent. PM 2.5 levels decreased 60 percent from 2005 to 2013, according to data from the U.S. Environmental Protection Agency (EPA) and the U.S. Energy Information Administration (EIA). The reasons for these declines is obvious, considering power plants have traditionally been the biggest source of this pollution and power plants just happen to be shifting from coal to natural gas at a record pace. Natural gas emits one-third the nitrogen oxide as coal and just one percent of the sulfur oxide of coal, and the two pollutants combine to form PM 2.5. Ironically, the U.S.’s progress in improving air quality, thanks in large part to the Marcellus Shale, is perhaps most evident in New York, which has infamously banned fracking. In 2005-2007, it’s estimated that PM2.5 levels in New York City contributed to over 3,100 deaths, over 2,000 hospitalizations for cardiovascular and respiratory disease, and 6,000 emergency department visits for asthma annually. So, even assuming for a moment that the Johns Hopkins study’s “association” of asthma exacerbation could actually be proven as causal, it is clear that shale development has done far more to reduce asthma and other troublesome ailments than it has done to make them more prevalent. The study also used satellite data from Skytruth, a group that is against hydraulic fracturing and indeed all industrial activity. Skytruth is funded by numerous anti-fracking groups, including the Tides Foundation, Greenpeace, Oceana and the Heinz Endowments. The researchers claim this study “adds to a growing body of evidence tying the fracking industry to health concerns.” Problem is, the study — and many others like it — actually doesn’t have any evidence to prove causation, while numerous studies that actually provide real evidence that fracking is reducing asthma throughout the U.S. continue to be overlooked.